Can the networks cope with app change? Sky Mobile TV is now usable over 3G, with Apple allowing the change to the app and giving users the option to stream television shows and live sports over the mobile phone networks. Sky's subscription mobile offering launched on the iPhone back in November – offering streaming television channels like Sky Sports News, Sky News and live sports channels over Wi-Fi. Now, for the £6 a month fee, Sky's channels will be available over 3G networks as well as Wi-Fi. 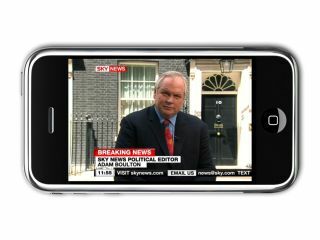 "The UK's largest Mobile TV service is now available on 3G for all iPhone users," Sky told TechRadar. "The Sky Mobile TV app launched in November last year and offers the best in live TV on the move initially allowing users to stream content over Wi-Fi from Sky Sports, Sky Sports News, Sky News, ESPN and At The Races. "Sports fans will be able to watch all live televised Barclays Premier League, Clydesdale Bank Scottish Premiere League and Coca Cola Football Leagues on 3G as well as live coverage of international and domestic cricket, PGA European Tour Golf, Guinness Premiership Rugby and a range of other sports. "Customers who already have the app will have received an update to advise them that the service is now available on 3G. New customers will need to download the app from the App store or at www.itunes.com/appstore and subscribe to the Sky Mobile TV service for £6 a month and register for a Sky customer ID." The app has been well received, with MacFormat's Chris Phin commenting on a Sky Mobile TV review published on TechRadar that the 'quality was incredible'. But will the 3G networks be able to cope with it? A spokesman for O2 was kind enough to tell TechRadar that the company was aware of the application. "Yes, I can confirm that the Sky Sports will work over our 3G network," said O2.